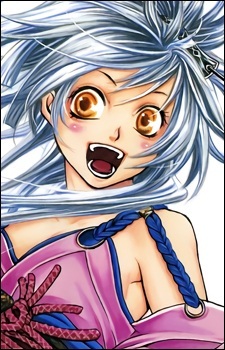 The main protagonist, an Izumo Priestess. She was found beneath the tori of Izumo Grand Shrine and raised by the head priest there. Her temple was massacred and so she escaped and ended up being saved by Saizo. After that she decides to follow him. She's a big eater, and her favorite foods are soba noodles and sweets. She seems to have taken a liking to Saizo, after he saved her and even asks Yukimura to let him stay with them, much to Saizo's dismay. She also has the most optomistic personality out of everyone. Isanami went through a break through after talking to Anastasia, thus realizing even though she has no skill, she has the biggest heart. Isanami then wishes to become stronger, no longer wanting to burden everyone. However, this is all a lie, because Ana is revealed to be a traitor who was just staying to get a hold of Rokuro's right eye, which left her very depressed. She seems to have a darker side to her personality, because she is a goddess who can sense people's emotions around her and she can take away many people's lives and she is said to be the goddess of murder and slaughter.